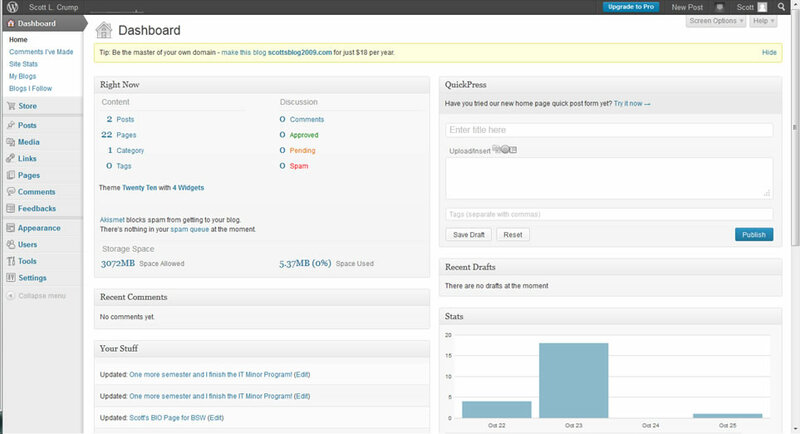 The following is a screenshot of the WordPress.com Dashboard. The beauty of http://wordpress.com/ is the simplicity, effectiveness, and clean design of it’s dashboard and administrative links. It truly adds a wealth of useability to even the newest blogger or website administrator. Use these tools effectively and you can make a powerful site in minutes. I would recommend that those just starting to dip their feet into the online web pool start with the free tools available using http://wordpress.com/ and as your site grows more robust and starts to need more refined tools then purchase your own domain with your existing framework being migrated to that domain with one of the wordpress.com partner hosting sites. some of my favorite plugins can be found at http://wordpress.org/extend/plugins/ . Fair warning though, to use these you have to host your site (wordpress application) with a well respected and robust hosting company that stays on top of new threats to sites like these and you must be conscientious about updating the application and the plugins on a regular basis. I really value that WordPress has made this easy and alerts the administrator of the need to update these elements in the dashboard clearly and easily. I really like http://wordpress.org/extend/plugins/jetpack/ which is a suite of plugins that previously were only available to http://wordpress.com/ users. Check it out, it’s really neat. I chose to use the Twenty Ten WordPress Theme because after perusing the available themes online, I did not see anything that I particularly liked as well. The Twenty Ten WordPress Theme is clean, functional and user friendly. It allows me to use all the power of WordPress.com without worrying about extensive modifications that I would need to do with some of the other themes to get them to work as well as this one does. I really enjoy the Widget, Sidebar menu for links and the top drop down menu for pages. That it has a calendar and a Search Widgets are an additional bonus.